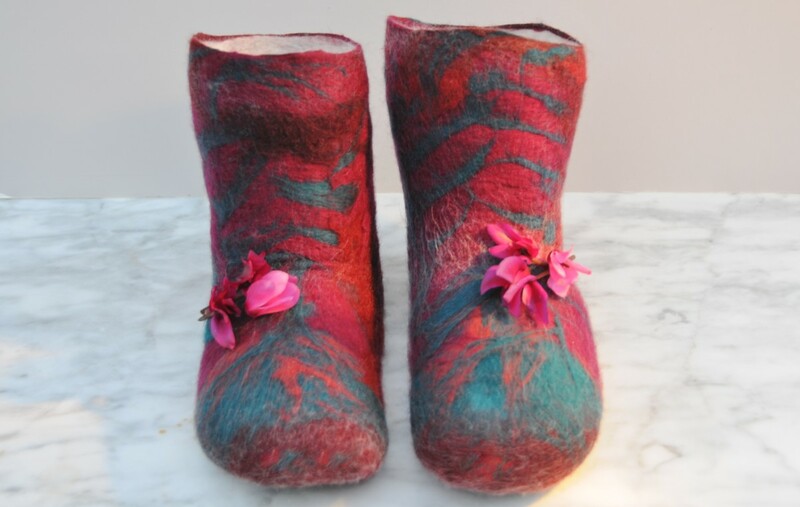 Nuno felting is a process of felting which was developed by Polly Stirling, a fibre artist from New South Wales in Australia in around 1992. The name is derived from the Japanese word "Nuno" meaning cloth. 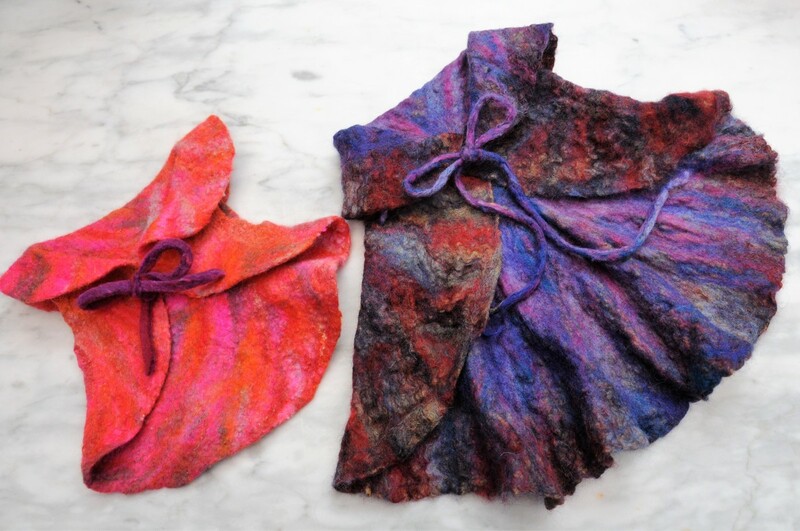 The technique bonds loose fibres into light weight fabric, usually silk, fine cotton or wool and results in a very lightweight fabric or felt with a lovely crinkly effect. A recycled piece of silk was used for this tutorial but cheap silk or even muslin can be used for this purpose. Both sides of the silk in this project were covered with a very fine layer of Merino wool fibres. The end result is a strong but very lightweight fabric with a gorgeous crinkle effect. A Bubble Wrap Template or you can use Laminate Floor Underlay which is not only cost effective but the templates made with it can be used multiple times over. A large bamboo blind. 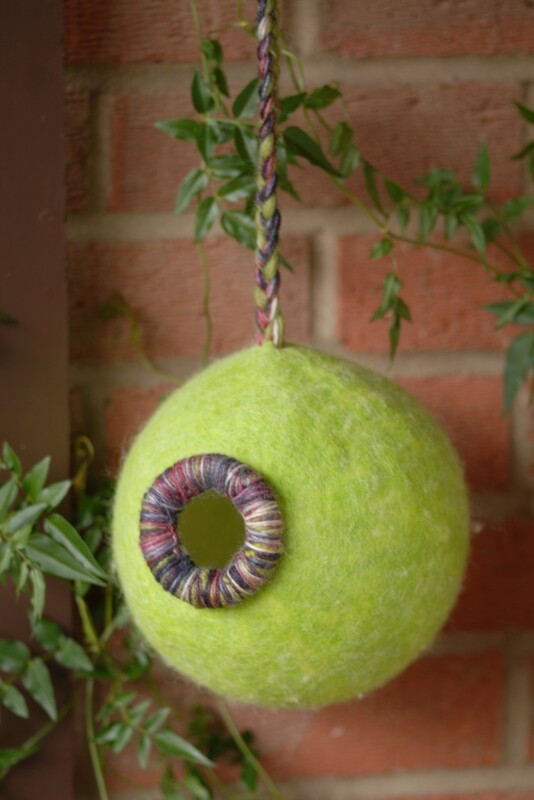 Bamboo blinds are one of my favourite felting tools and these too can be used over and over again for most of your felting projects. A Baby Grow or T-shirt in the size of the baby you will be making this for. (This is a non-essential item) but may be used to help you decide if or where you need to cut arms holes into the circle jacket if desired. Alternatively, you may keep the jacket simple and turn it into a 'Cape'. A circle of pure silk fabric. 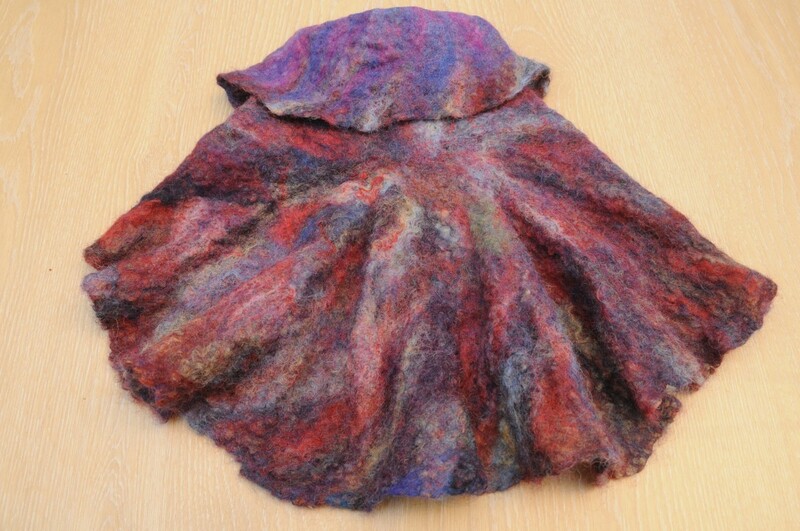 This can be recycled pure silk or even a recycled scarf or silk fabric bought specifically for the purpose. 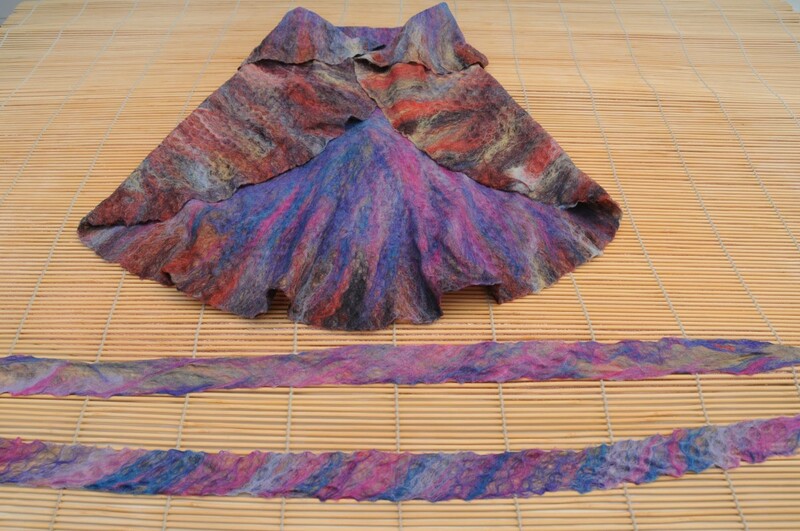 2 Narrow pure silk strips which can be torn from the main piece to form the jacket ties. 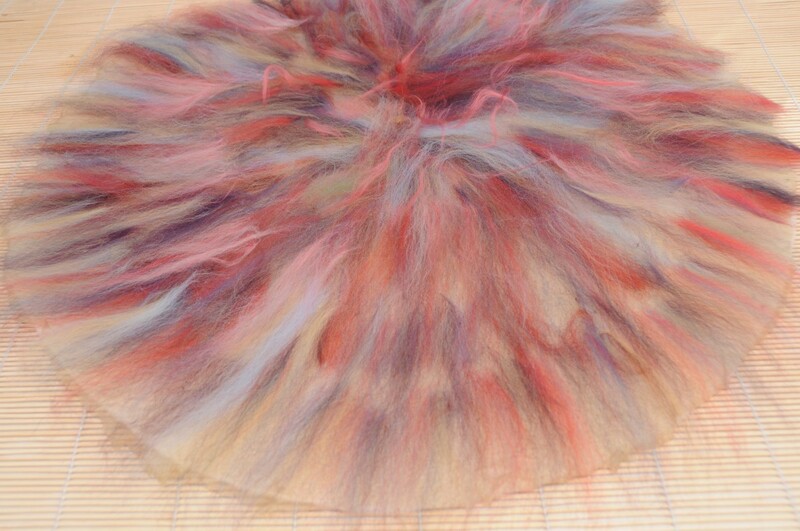 A small quantity of Merino Wool Roving in mixed colours. I used Botany Waste Wool which I purchased from World of Wool. 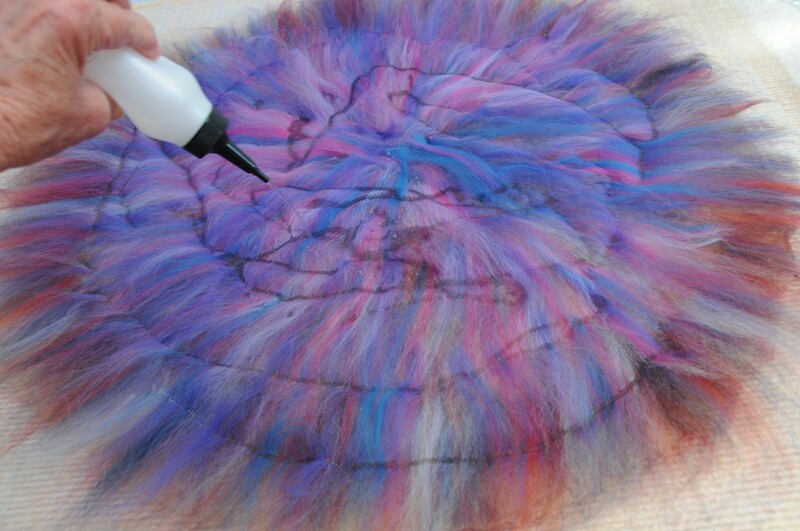 This is such a good buy and can be used for many felting projects. Tepid soapy water. This can be dishwashing liquid or grated Olive Oil soap diluted in water, both of which work equally well though the latter is a lot kinder to the hands. 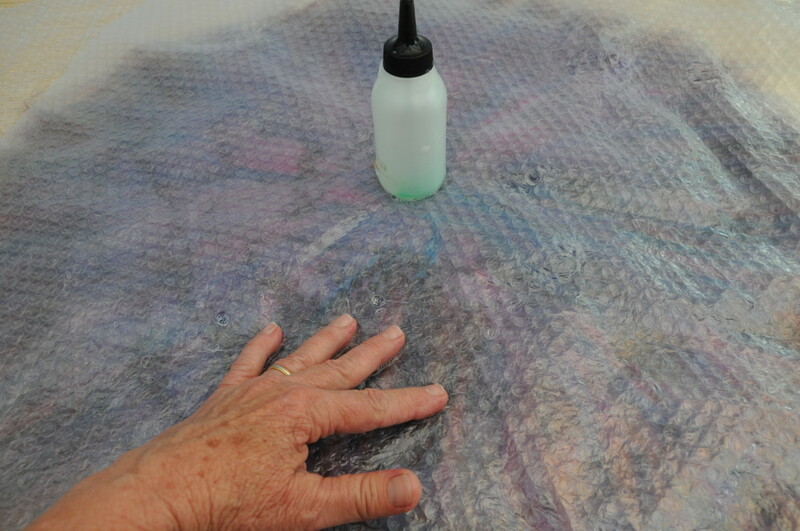 Draw the template onto a large sheet of floor underlay or bubble wrap. The circle should measure approximately 26 inches across the centre for a newborn child, bigger for an older child and a much larger for an adult. Shrinkage is usually in the region of 40%. This was factored in when the circle was drawn for this project. There are many variables. 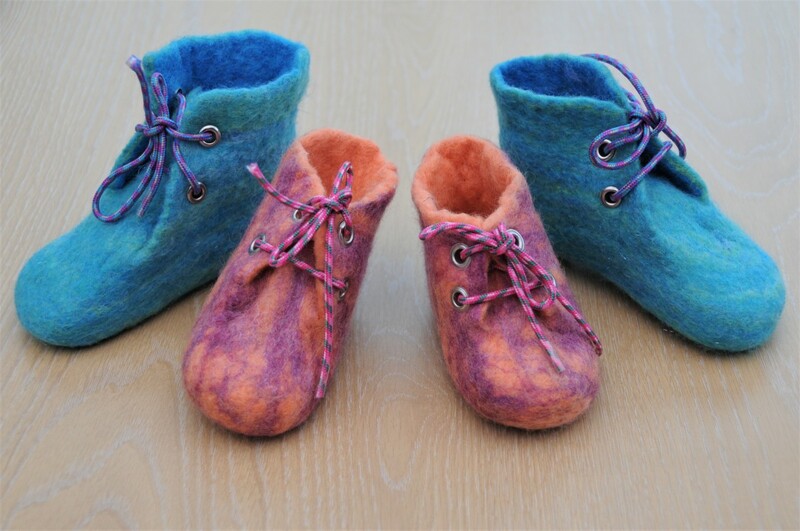 Unfortunately, felting is not an exact science and even the amount of wool which is applied to the silk can alter the outcome of a 'Nuno' felted project. The less wool added the more crinkles you are likely to have. Experiment and have fun doing so. 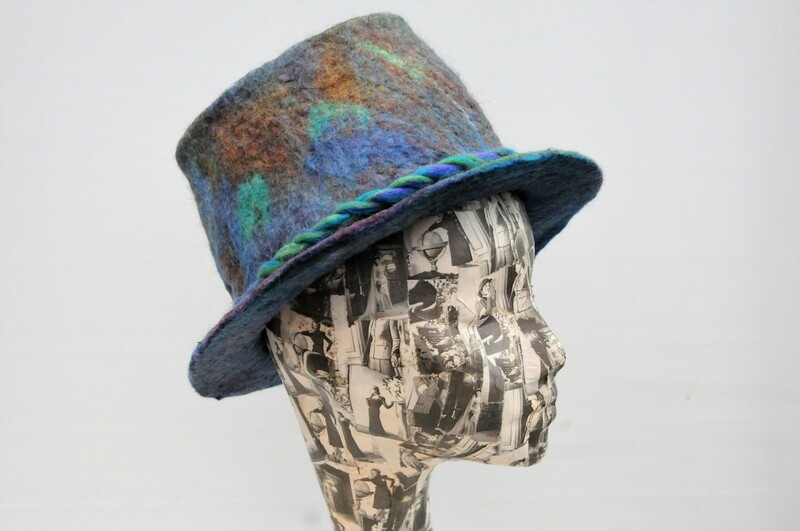 This project uses 2 layers of wool, 1 layer is applied to each side of the silk fabric. 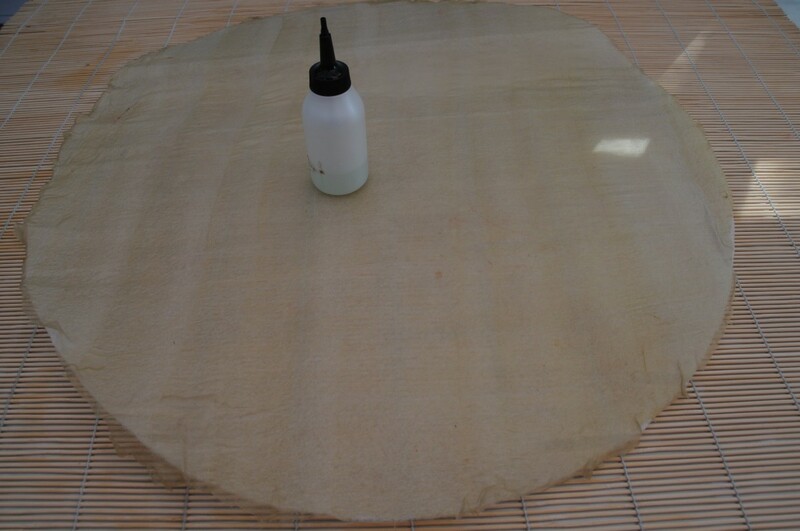 The Template Which Has a Diameter of 26"
Wet the surface of the template using the soapy water. 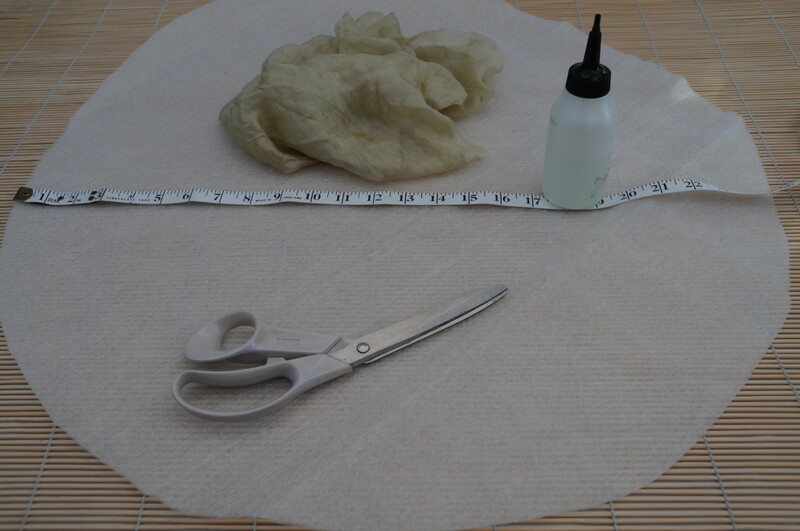 Roughly cut out a circle of silk and place it neatly onto the template. 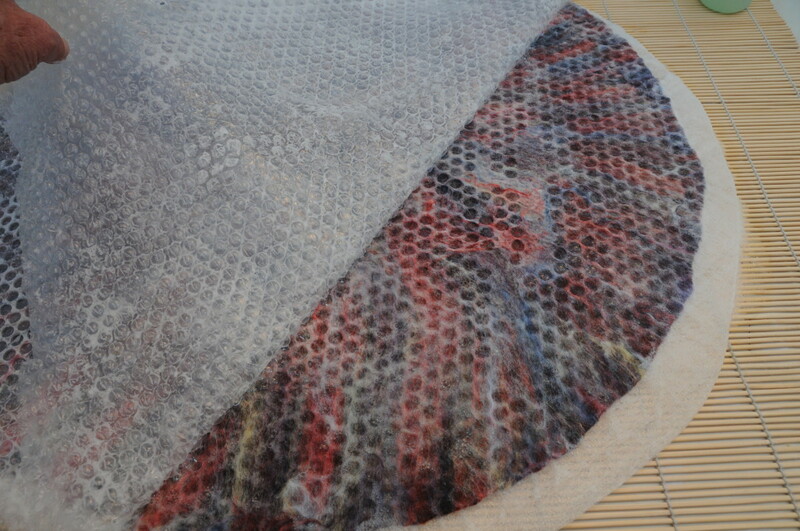 The pure silk fabric will cling to the wet template. Smooth out any creases with your fingers. 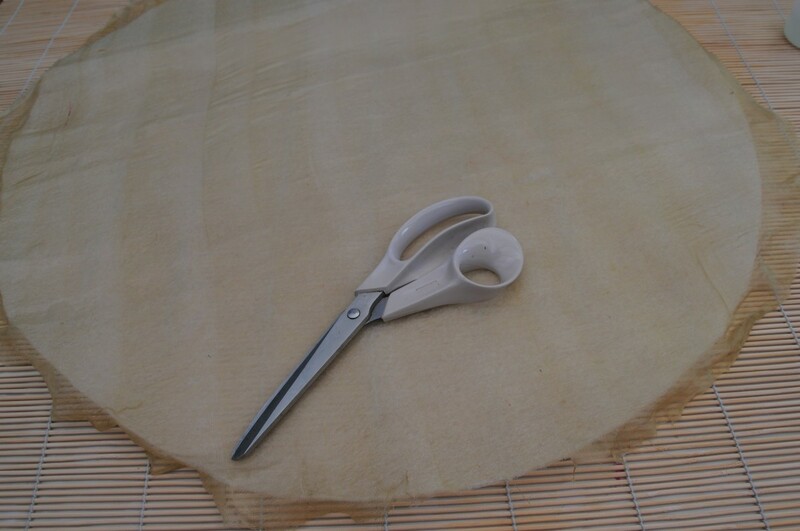 Adding water to the template allows the silk to cling easily to the template, after which the edges can be trimmed and neatened to fit the circle properly. The chosen silk should have a fine texture and be whisper thin. 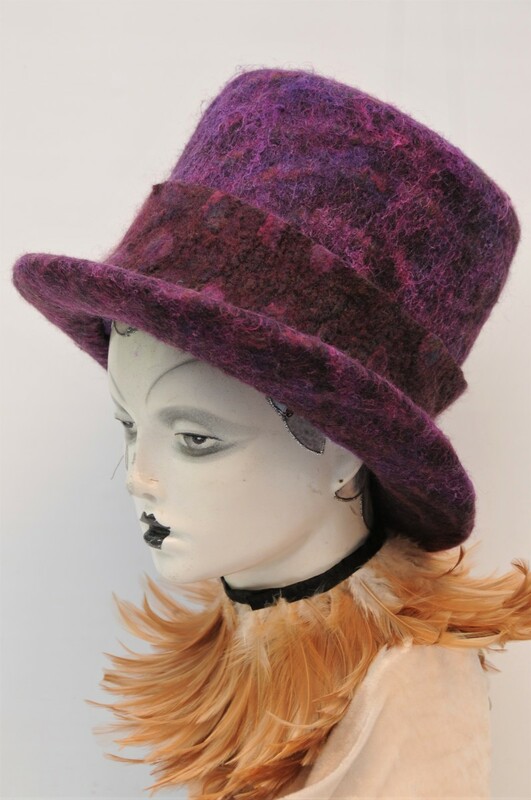 If you cannot feel your breath when you blow through the fabric is not thin enough for the wool fibres to easily penetrate the fabric during the felting process. 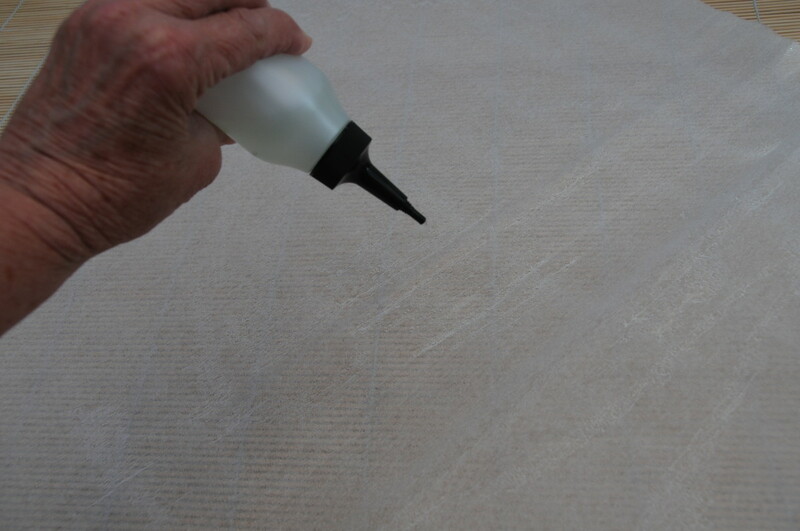 Trim any excess wet fabric which overlaps the edges as is shown below. 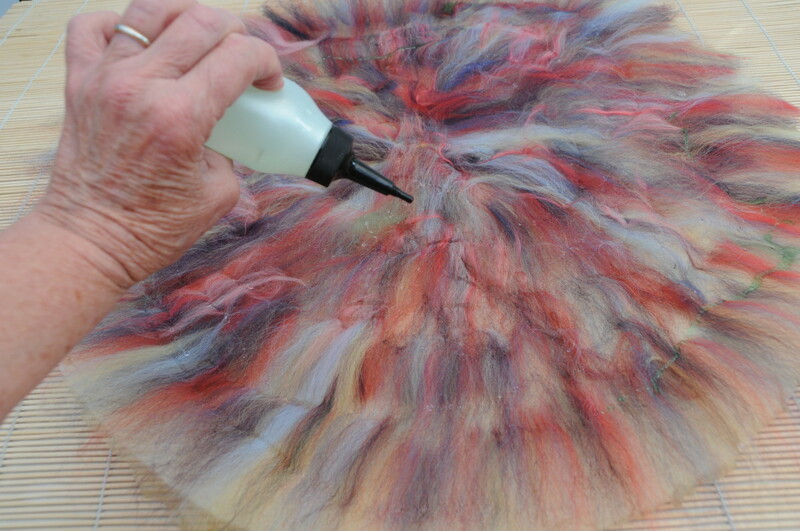 Cover the layer of silk using a fine layer of wool roving as is shown below. 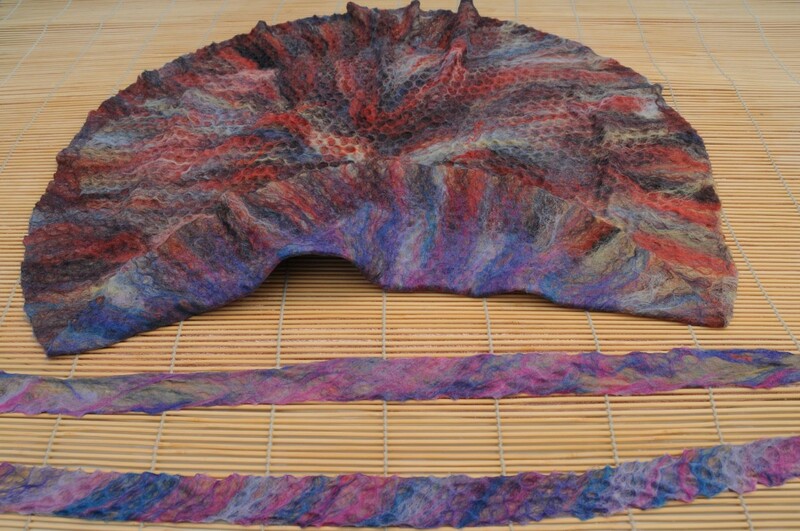 The wool roving should just overlap the edges of the silk covered template. A Note on Getting the Water Temperature Right! 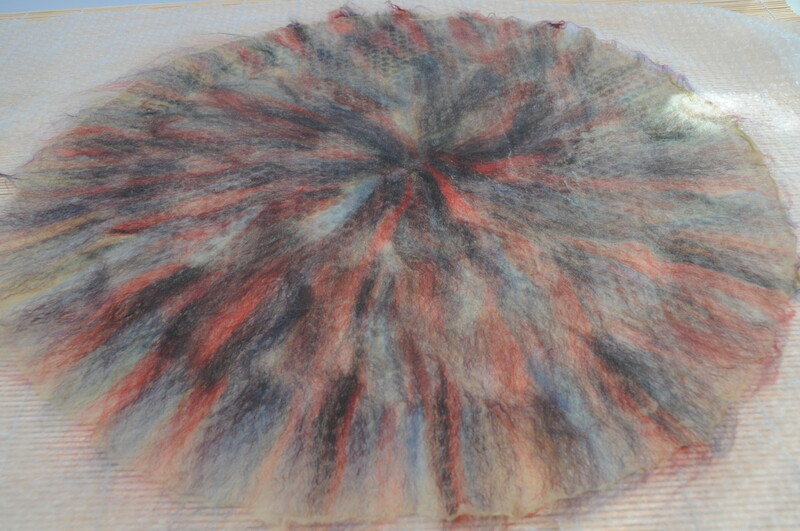 Only tepid or cold water should be used when 'Nuno' Felting. 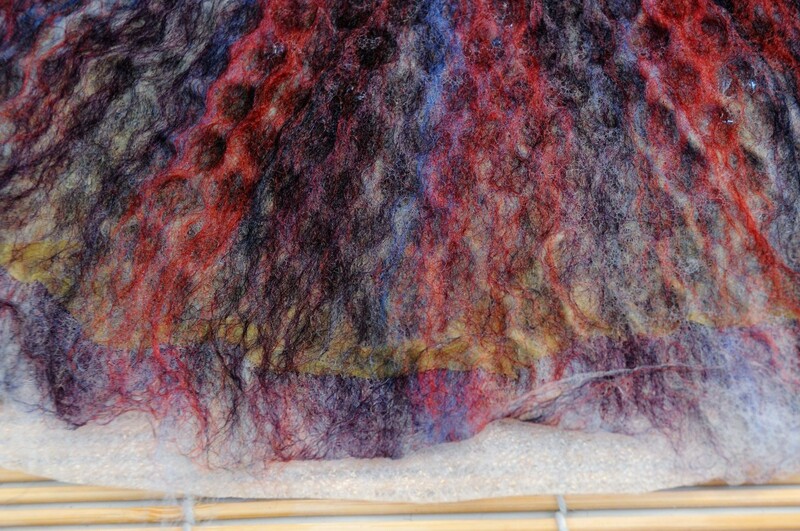 Using hot water will shrink the fibres before they are able to penetrate the pure silk so don't use it in the early stages of the felting process. Hot water should only be used after the fibres have penetrated the silk and before you shrink them under hot and cold water in the kitchen sink. 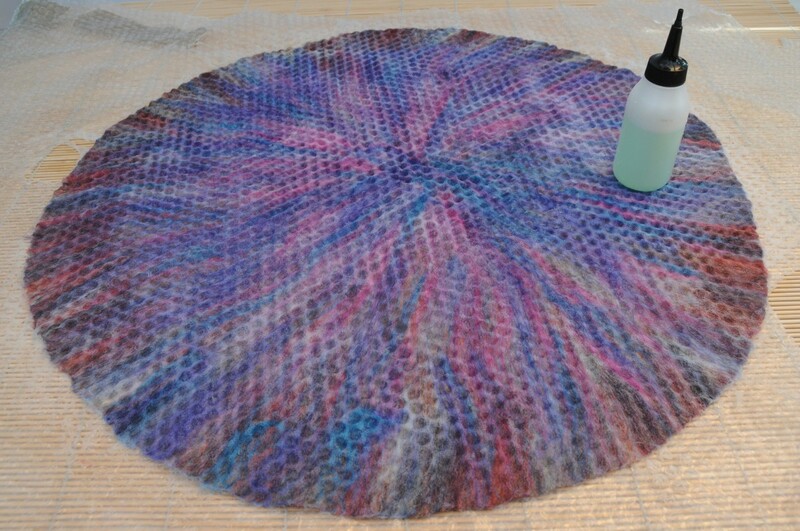 Wet the wool roving using only tepid or cold soapy water. 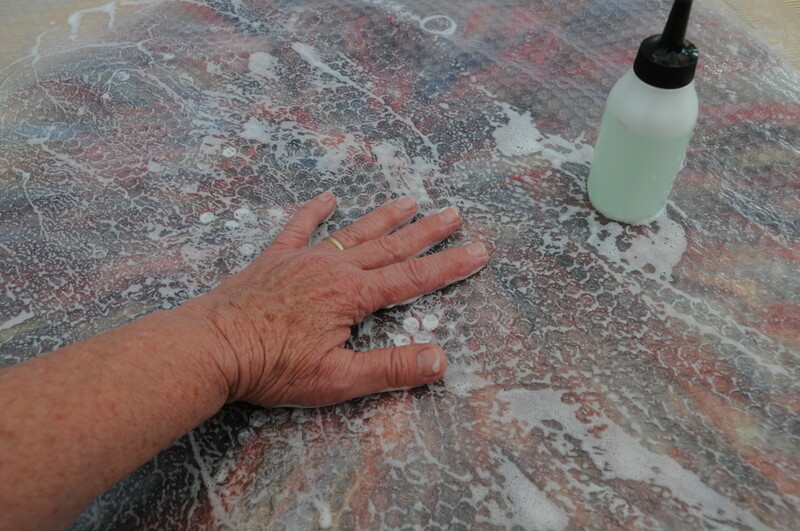 Wet the surface of the bubble wrap with some of the soapy water. The soap makes it easy for the fingers to glide over the surface of the bubble wrap. 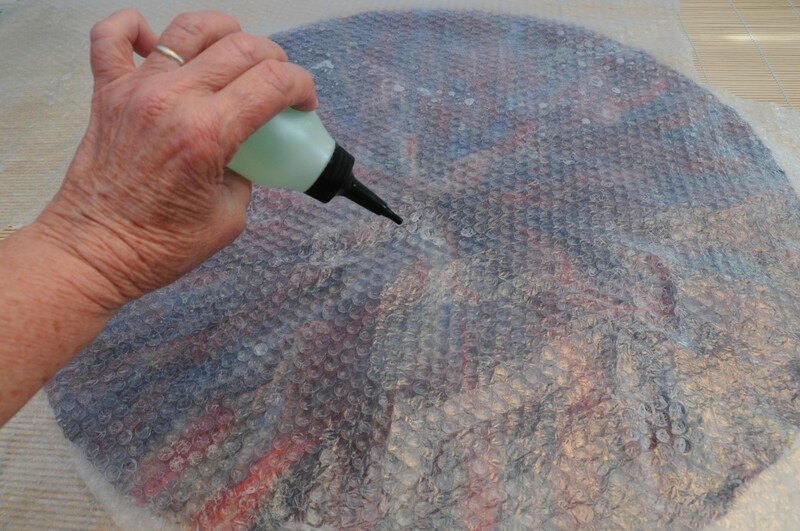 Rub the surface of the bubble wrap until the fibres below are completely smooth. Turn the project over and remove the template gently. Now cover the 2nd side from which you have just removed the template with a fine layer of Merino wool. Don't make the edges thick as these will soon be folded over the silk below to neaten the edges. Wet the 2nd side with tepid soapy water. 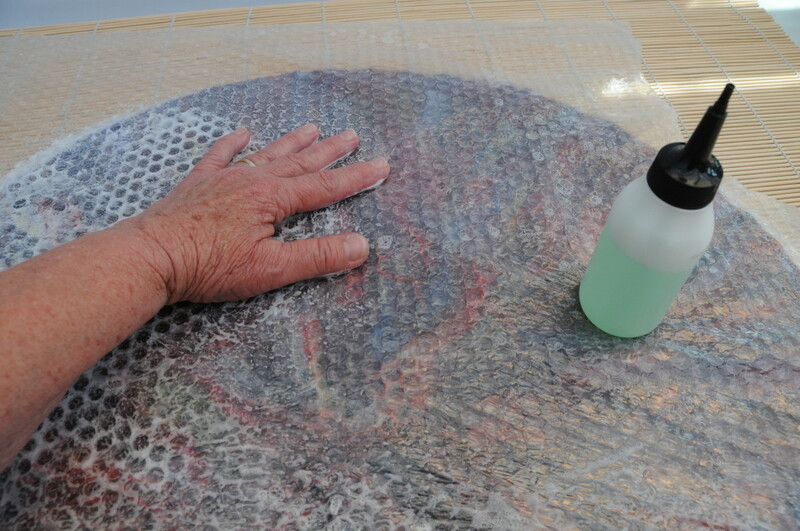 Wet the surface of the bubble wrap to facilitate easy rubbing. The project should now be sandwiched between 2 Sheets of Bubble Wrap. 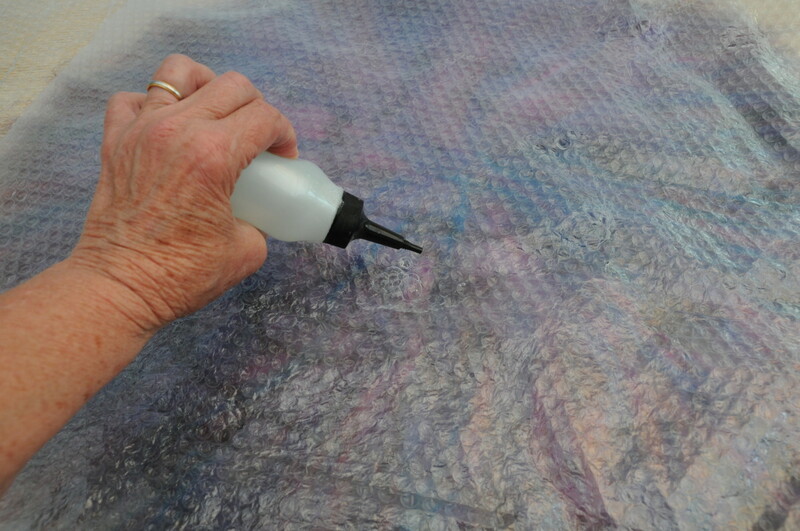 Rub the surface of the bubble wrap until the fibres below are smooth. Fold both layers of Merino wool fibres neatly over the edges of the silk. 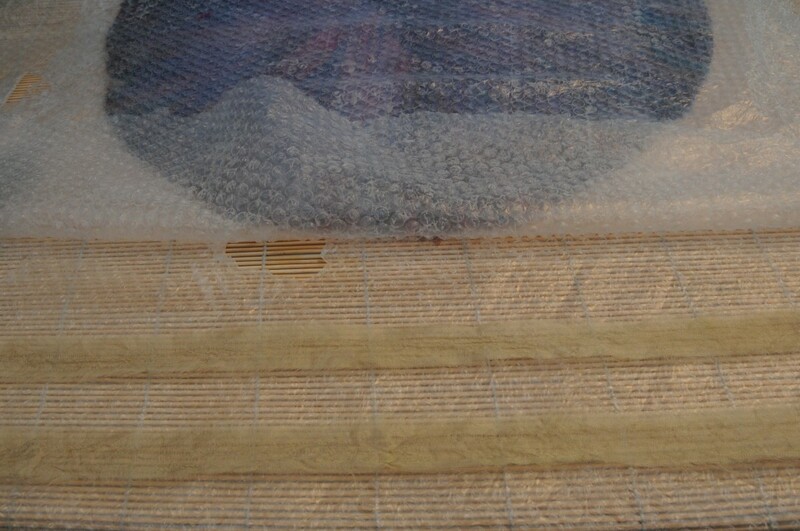 The silk fabric can be seen through the fine layer of merino wool fibres which was used to cover the template. 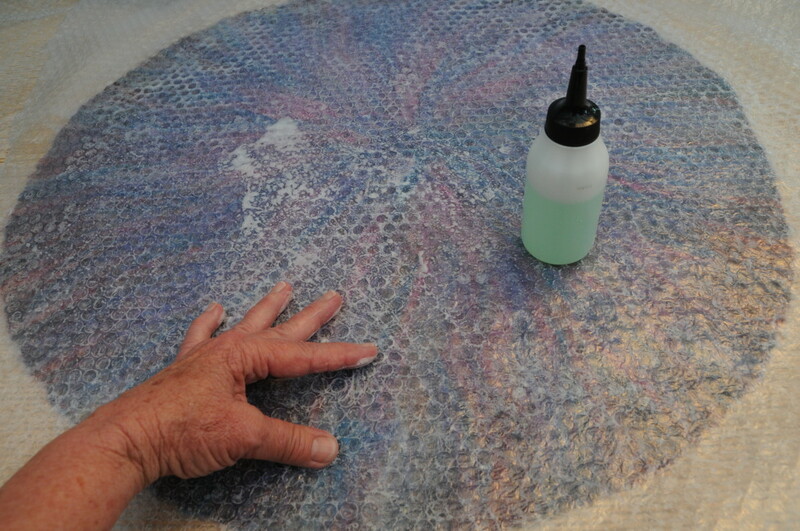 Wet the surface of the bubble wrap with soapy water. Rub the edges until they are flat, neat and tidy. Sandwich the Project between two layers of bubble wrap. 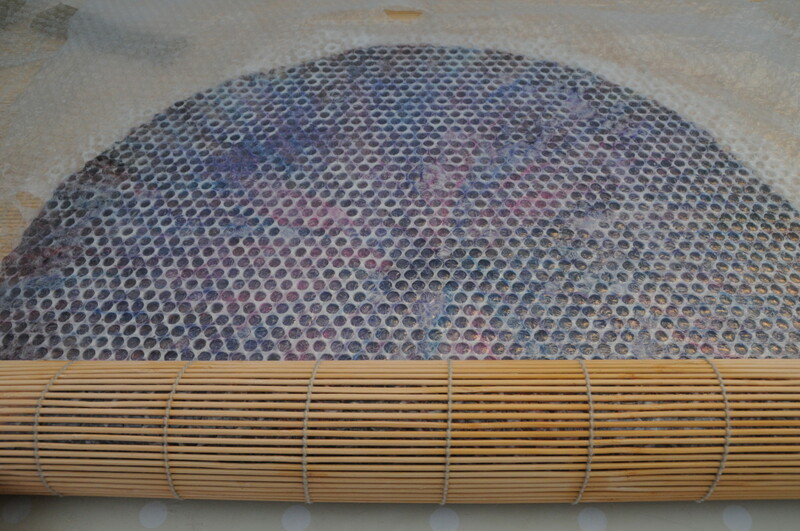 A layer on each side will prevent the fibres from becoming displaced when the fibres are rolled inside the bamboo blind. 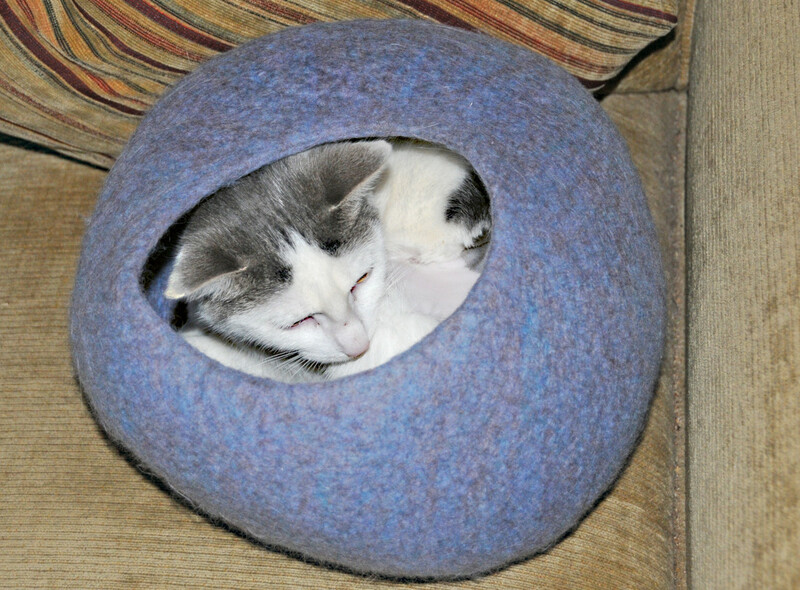 NB If no blind is available, roll the bubble wrap up with the project still inside and rub until felted. It will take a little longer without the blind. In either case, keep on rotating the contents of the blind or bubble wrap to allow for even shrinkage throughout the project. 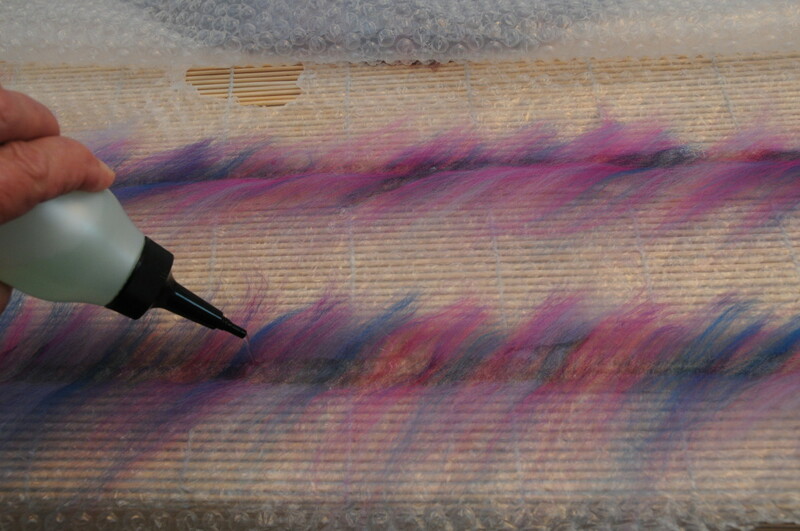 A bamboo mat helps provide the perfect rolling tool making light work of the felting process. 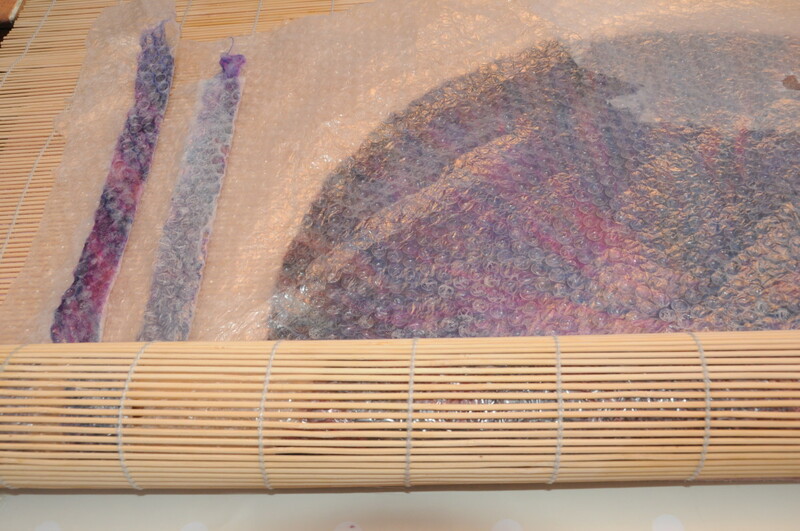 Rotate the contents of the blind or bubble wrap frequently throughout the rolling process. 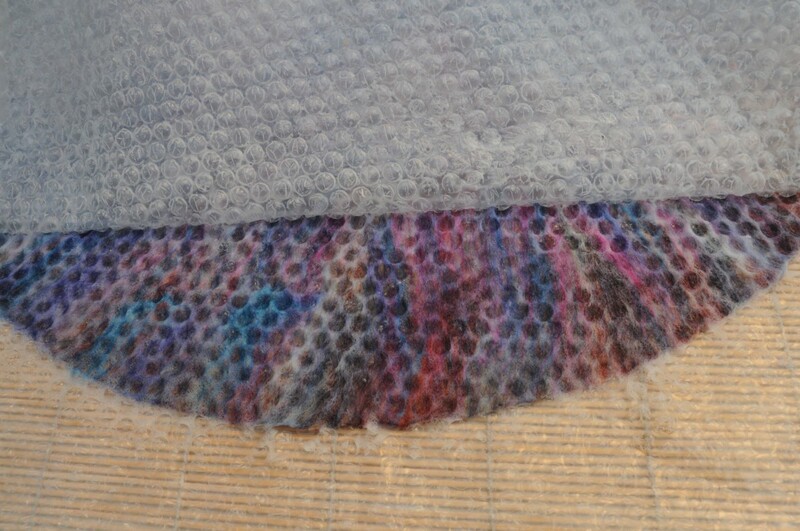 Tear two strips off the pure silk fabric and cover them with a fine layer of wool roving. 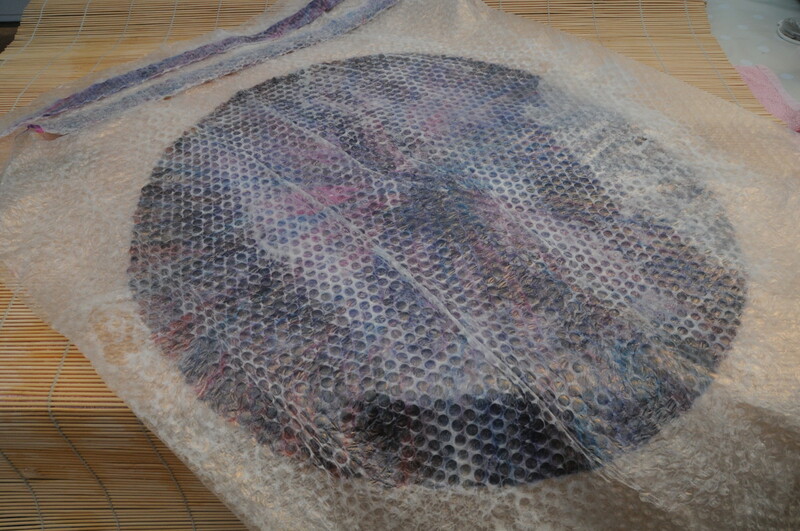 Wet and fold in the edges with the help of the bubble wrap. 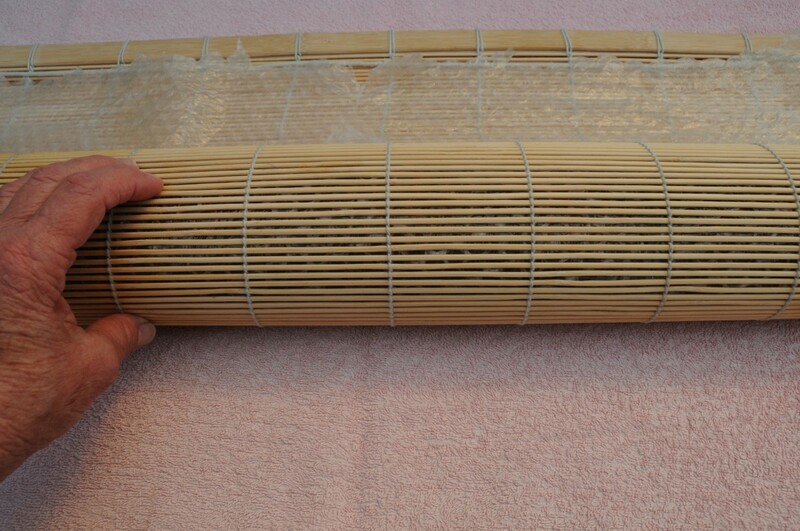 The jacket ties can be added to the contents of the bamboo mat or bubble wrap and rolled simultaneously to shorten the time needed to complete the project. Use the Bubblewrap to fold over both edges of the 2 jacket ties. 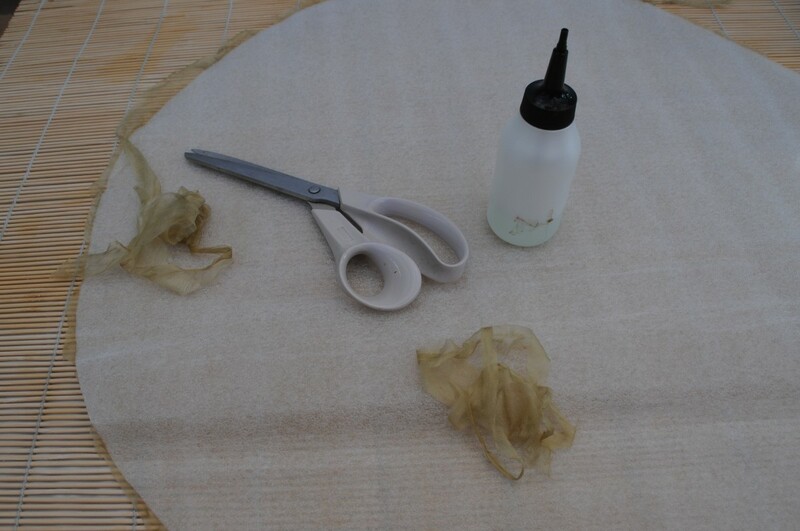 Enclose the silk covered wool inside the strips of bubble wrap and include them in the bamboo bundle whilst rolling the project to save time. Pinch the fibre between 2 fingers to check to see if they move. When you are satisfied that the fibres no longer move between your fingers, remove the wrap and take the project and the 2 ties to the kitchen sink. Massage the circle of felt using the palms of your hand under hot and then cold water. You will begin to see the fibres shrink under your hands. When the project has shrunk properly, rinse it first under hot and then cold water. Squeeze out any excess water and throw the project down onto a hard counter to 'full' further. Shape and fold the collar over as shown. Roll the jacket ties and attach them to the jacket using a few simple sewing stitches. If desired cut armholes in the appropriate places using the 'Babygrow' shown above to make the appropriate cut. Massage the cut edges until they shrink evenly. 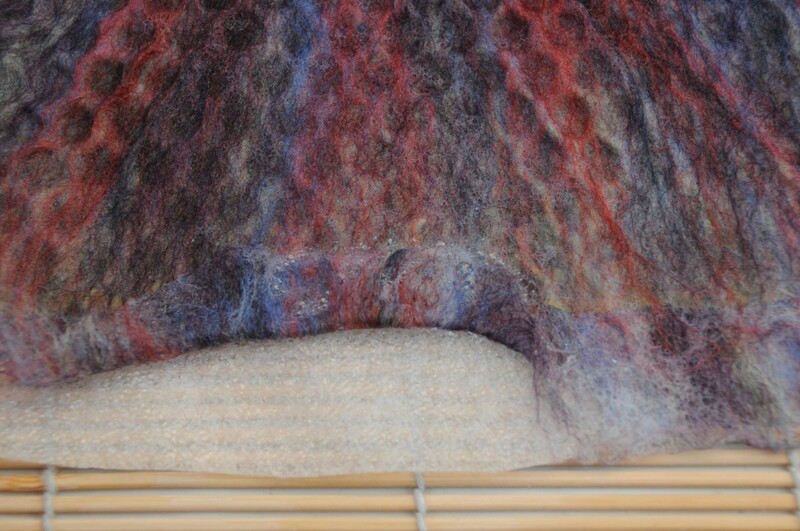 What type of Nuno Felting Projects would you like to learn more about? I know you do, perhaps this year is not my year! My subject matter is perhaps a little obscure for one of those this year:) Like I said, you are so very kind. "I meant every word of it." "You need to be voted to win some type of Hubbie Award. And I mean every word of this." Hi Kenneth, You are so very kind and your visit is very much appreciated. Thank you so much! (Sept. 11--yes. Taking a moment for obvious reasons). I am so sorry that I haven't visited your page in a while. The only thing that I can share is: Life, many times, crops up when you are busy trying to do things that you thought were needful. I was simply amazed at how much work that your beautiful projects take. Amazing. And the end result . . .WOW! Great job. Plus, you presented your topic perfectly. I have a photo of the recipient and her new baby wearing it. Apparently, the cape drew a lot of praise from friends and family at a local music festival. Thanks for taking the time to comment. A lot of creative thought is in this article and the clothing. I imagine this would look very sweet on any baby girl. I think my family and friends have come to accept that any gifts I give them will always be handcrafted or made in the kitchen. I love making good old condensed milk fudge as only an ex South African can make:) I pack it into little Christmas sweet boxes which I buy from a local sweet shop. 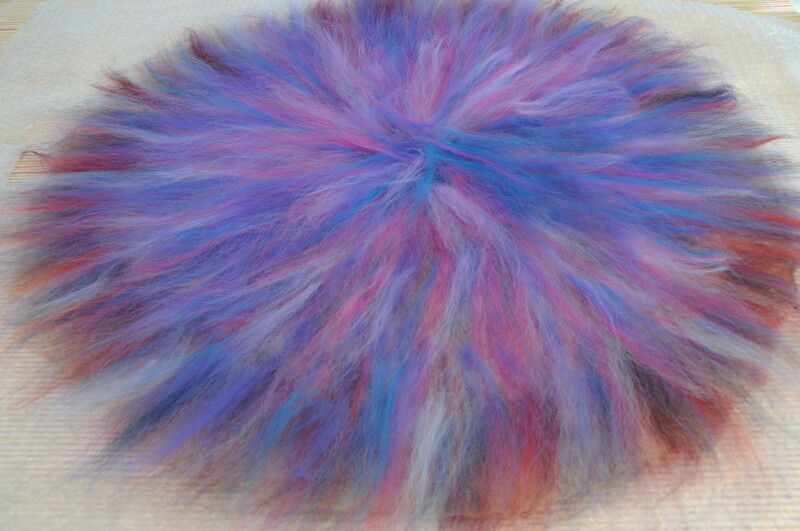 I give hats and flowers, little coin purses and wet felted soaps for Christmas. Even the children squeal with delight when they get a hat now but I do try to ring the changes for Christmas. 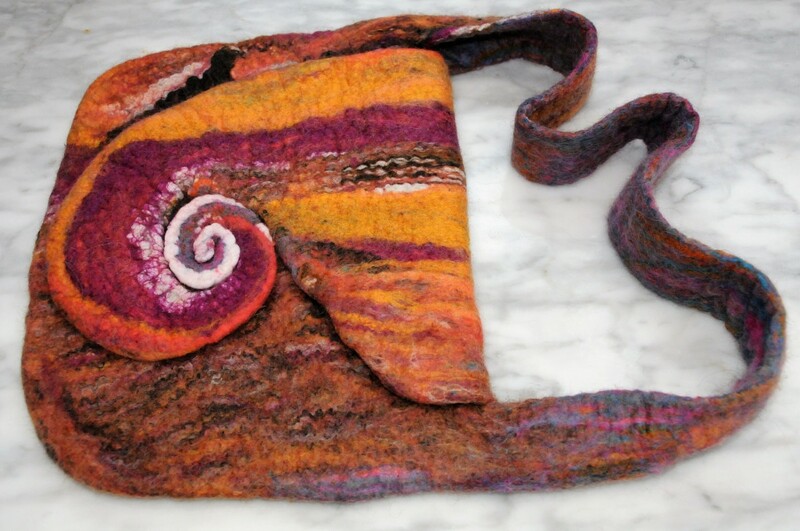 Nuno felted scarves are wonderful and I have a lot of vintage pure silk scarves which I can Nuno felt. Thanks for stopping by. 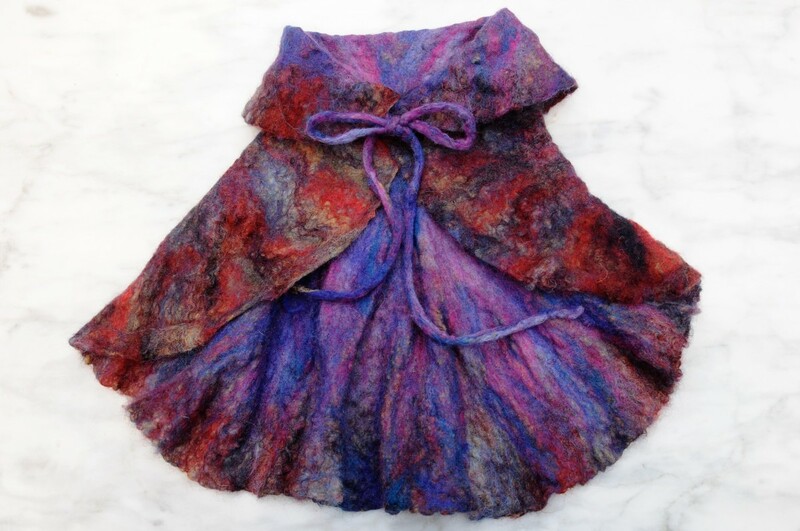 This Nuno felting is just as jaw-dropping awesome as the others! Thanks for sharing your felt projects, Sally! I would love to see your Christmas gifts. Another instructive and fascinating tutorial, Sally! 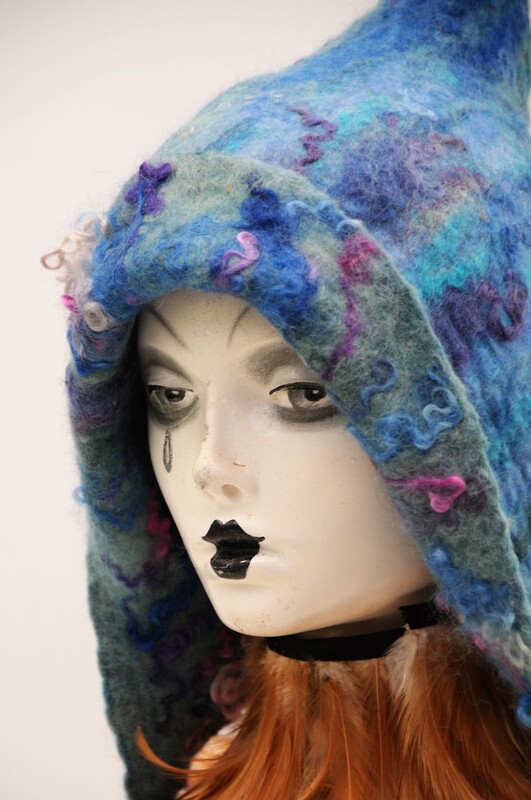 I've heard the term "nuno" referred to in felting, but never really knew what it meant. 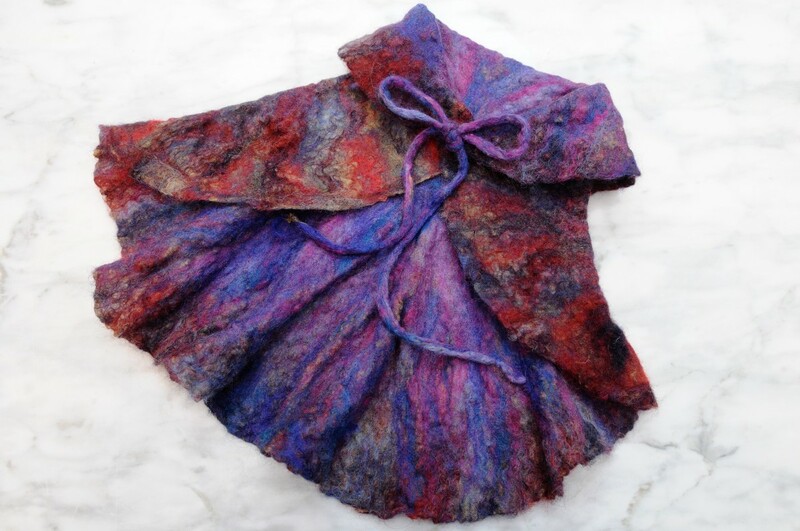 This cape is such a cute garment and looks like a lot of fun to make. Thanks for sharing and posting! Thank you, MsDora, your continued support is appreciated as always. You're just so good with your instructions and your pictures and your finished product are always desirable. This one certainly is. Thanks for sharing your expertise for us to admire. I so admire your beautiful work. I only wish I had the talent (and patience) to do it! That being said, I am content in the vicarious pleasure of watching you felt! Thank you so much! It is always nice to receive feedback on my writing. It is much appreciated. Hi Sally, you have accomplished one of the best hubs. In detail and with stunning photos! I like how you explained and with a creative mind, as always. Take care!